* 3-4년 전에 쓴 글인데 하드 드라이버에 저장되어 있는 것을 보고 그대로 올립니다. 에릭 호퍼라는 사람의 전기가 하도 극적입니다. 약 두어 달 전 헌책방에서 자그만 책자 하나를 집어 들었다. 에릭 호퍼 (Eric Hoffer)라는 사람이 쓴 [The True Believer]라는 책으로 1957년에 출판되었다. 출판 당시의 책의 가격은 50 센트로 되어 있었다. 책 방 주인은 2불 50센트로 가격을 매겨놓았다. 그런데 이 책은 책장을 넘기기에도 힘들 정도로 너덜너덜 했다. 그래서 주인은 나보고 그냥 가져 가라고 했다. 내가 이 책을 집어 든 이유가 제목 때문만은 아니었다. 이전에 읽은 책에 이 책이 인용되었다는 기억을 떠올린 것이다. 바로 Dean Kelly의 책 [Why Conservative Churches are Growing] New York: Harper & Row, 1972이었다. 이 책은 종교가 권력을 잃어 가는 과정을 세속화 이론으로 정식화한 학자들이 팽배하던 시절 외로이 보수적 교회가 성장한 이유를 매우 설득력있게 설명한 책이다. 그것도 지금으로부터 30년 전에 썼으니 이 분야에 선구자적인 책인 셈이다. 켈리는 보수교회 또는 종파적 교회의 성장에 대한 개념적 도구를 바로 호퍼에게서 빌어 온 것이다. 호퍼의 이 책이 1952년에 출판된 것을 감안하면, 켈리는 꼭 20년 후에 자신의 사회학적 이론 정립을 위해서 호퍼를 인용한 것이다. 그런데 나는 다른 일에 쫓겨 호퍼의 The True Believer를 몇 장을 보다가 중단해야 했다. 그러던 중 내가 호퍼에 대해서 다시 관심을 갖게 된 것은 그의 다른 책을 지난 주에 헌 책방에서 찾아 낸 것이다. 이 책은 The Ordeal of Change로서 1963년에 처음 출판되었고, 내가 구한 것은 1967년 Harper & Row에서 출간한 것이었다. 이 책의 뒷 켠에 호퍼에 대한 간략한 약력이 적혀 있었다. 그는 센프란시스코에서 부두 노동자로 일한 다는 것이었다. 그는 학교에 진학한 적이 없었다. 15살 나이에 시력를 거의 잃었었는데 다시 회복되었을 때 그는 인쇄물에 흠뻑 젖어 들게 된다. 그의 아버지가 세상을 떠났을 때, 호퍼는 몇가지 사실을 깨닫게 된다. 첫째, 공장에서 일하고 싶지 않았다. 둘째, 직장 상사와 함께 지내기 힘들었다. 그래서 그는 동부를 떠나 가난한 사람의 나라 캘리포니아를 향해 떠난다. 이것이 호퍼가 책읽기와 쓰기에 몰두할 수 있게 한 결정적인 계기가 된다. 그는 10년 동안 이리저리 떠돌아 다니는 이주 노동자나 광부로 일을 한다. 그러면서 그는 계속 열심히 책을 읽고 글쓰기를 한다. 그는 철도를 따라 형성되어 있는 10여 개의 도시 도서관의 열람 카드를 갖고 책을 빌려 보면서 책을 쓰게 된 것이다. 얼마나 신났을까 생각해 보자. 오늘은 이 도시에서 책을 빌리고 내일은 저 도시에서 빌린 책을 돌려 주고, 지난 번에 빌린 책을 돌려 주고…. 오늘 다시 호퍼의 책 The Ordeal of Change를 읽으면서 그에 대한 궁금증이 증폭하기 시작하였다. 그는 간명한 문체와 명쾌한 논리로 전체주의, 공산주의, 민족주의 등을 거침없이 논하고 있었다. 그의 책의 주요 논지는 급격히 사회가 변할 때, 인간들 (개인 그리고 집단)이 어떤 심리학적/사회학적 반응을 하는지 논하는 것처럼 보인다 (다 못보았으니…모르겠다). 다시 인터넷을 검색해 보았다. 놀랍게도 Amazon에서 거의 책이 여전히 팔리고 있었다. 이 책에 대한 평가는 여전히 좋았다. 서평자들의 논평도 가관이었다. 이 책이 오사마 빈 라덴을 위시한 테러리스트를 이해하기 위한 좋은 책에서부터 부시를 이해하기 위한 책이라는 둥, 또는 911 사태 이후 다시 재조명 되고 있다는 내용도 섞여 있었다. 그러고 보면, 30년 전 호퍼의 책을 인용한 켈리가 가장 중립적 입장에 있다는 생각이 든다. 외롭게 보수 교회의 성장을 사회학적으로 분석한 켈리에게서 호퍼의 지성이 되살아 나고 있는 셈이다. 또 하나는 The Eric Hoffer Resource라는 웹사이트였다. 여기에는 호퍼의 약력과 책판물이 매우 상세하게 소개되어 있다. 그 중에서 역시 관심을 끄는 것은 그의 학력이다. 그런 그의 책들이 50-60년대를 풍미했다는 것은 실로 극적이지 않을 수 없다. 지식을 향한 추구, 또는 진리를 향한 열정은 학벌도 나이도 소용이 없다는 것. 바로 열정이 사람의 미래를 결정한다는 것이었다. 한국에서 초등학교 졸업이 전부인 장정일을 두고 모 대학의 박사과정 학생이 쓴 장정일 평론을 읽고 실소를 한 적이 있다. 그 자의 논지는 장정일은 초등학교 교육을 받지 못해 그의 인식에는 태생적 한계가 있다는 것, 뭐 그런 것이었다. 그 때가 아마 10년 전쯤이었던 것 같다. ㅋㅋ 웃기는 녀석이라 생각했다. 어디 위대한 시인이 학력을 먹고 태어난 것도 아니고 위대한 정치가가 학벌로 밥 말아 먹는 것만은 아닌 것이다. 호퍼의 삶은 시적 삶이다. 한 때 그의 업적을 기리어, UCLA의 교수로 초빙되어 교수까지 되었지만 이 모든 것을 훌훌 털고 글쓰기를 계속한 호퍼. 그에게서 인생의 멋이 느껴진다. 무학의 경력에서 물들지 않은 이상적인 정치적 존재를 본다. 지나가다 두서 없이 읊어 보았습니다. "Good and evil grow up together and are bound in an equilibrium that cannot be sundered. The most we can do is try to tilt the equilibrium toward the good." Eric Hoffer was a self-educated longshoreman who came to fame in the 1950's with the publication of his first book, "The True Believer." 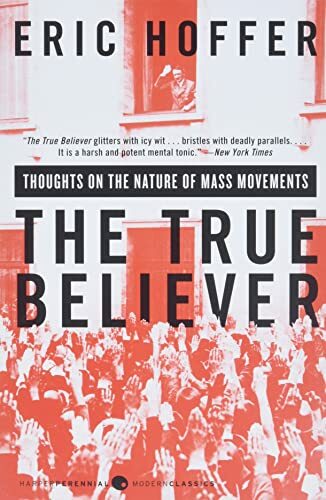 A caustic analysis of the nature of mass movements and those who are driven to join them, "The True Believer" did what no other book of the mid-twentieth century could: it helped expose the hidden causes of the tumultuous events that nearly destroyed our world at that time. Hoffer said of the 1930's, "It colors my thinking and shapes my attitude toward events. I can never forget that one of the most gifted, best educated nations in the world, of its own free will, surrendered its fate into the hands of a maniac." "The True Believer," though, is not solely concerned with the rise of Nazi Germany, but with the origination of all mass movements, creative or destructive. And more importantly, it is concerned with the main ingredient of such movements, the frustrated individual. The book probes into the psychology of the frustrated and dissatisfied, those who would eagerly sacrifice themselves for any cause that might give their meaningless lives some sense of significance. The alienated seek to lose themselves in these movements by adopting those fanatical attitudes that are, according to Hoffer, fundamentally "a flight from the self." Hoffer's first book dove into the subject that ultimately occupied him for his entire writing career and interested him throughout his life. That subject was not merely the discontented individual, but the creative and fulfilled individual as well. The nature of man and the individual human being have always been primary themes in the history of philosophical thought, and Hoffer's struggles with these concepts and questions have produced some particularly illuminating insights. He writes, "It is the individual alone who is timeless. The individual's hungers, anxieties, dreams, and preoccupations have remained unchanged throughout the millennia." It is fitting that a true individual, as Hoffer most certainly was, would demonstrate a deep understanding of human nature not only in his writings, but in his life as well. Born in 1902, Hoffer grew up in the Bronx under the care of a household servant after his mother died when he was seven. When his father died in 1920, Eric moved by himself to the west coast, determined to avoid factory work and "stay poor." A born reader, he began to educate himself in the libraries of California while he supported himself with odd jobs and migrant farm labor. He lived his life on the road until 1941. When the war broke out, he attempted to join the military, but was rejected for health reasons. He joined the Longshoreman's Union instead and became a stevedore, doing the most difficult work possible in order to help the war effort in whatever way he could. For the next twenty-five years, he both worked the waterfront and actively pursued the knowledge and education that he had pursued all his life, reading, writing, struggling, and playing with the ideas that would be his life's work. He published ten books between 1951 and 1982, and an eleventh was published after his death in 1983. As short as it may be, this is all the introduction that should be given here. Hoffer lived an interesting life, and the events of it are better told in the several available biographies, plus the autobiography "Truth Imagined." Also, because of the terseness and clarity of his writing, a summary of Hoffer's main ideas cannot be particularly exciting or fruitful. It is best to read his words and grapple with his ideas as he expressed them himself. This, then, brings us to the purpose of "The Eric Hoffer Resource." The page is intended as a resource on Hoffer for those who may have searched for information about him on the internet in the past without luck. It is also hoped that the page may attract those not yet familiar with Hoffer and spark in them an interest in his ideas and writings.